Our valuation tool calculates automatically a value for the company based on financial statement data and automatically generated forecasts. The weight of the different valuation methods depends on the company’s financial state. The methods used are selected case-by-case. However, companies can be divided into four main groups, and the valuation methods are selected based on which group the company belongs to. Underneath is a description of all the valuation methods used and how they are chosen when valuing a company. Book value of equity is the accounting value of company’s share capital, retained earnings, reserves and other similar items. It represents the value that is left to the shareholders when the liabilities are deducted from the assets; thus it can be seen as the liquidation value of the company. Another way to interpret the book value of equity is to see it as the portion of the company’s assets that are financed (meaning investments and retained earnings) by the owners of the company. In most cases, the book value of equity is not a relevant indicator of the company value. This due to the fact that especially in companies with steady earnings and healthy growth figures the value of the company depends on the returns that it is generating to the owners, not on the size of the equity that company uses to generate these returns. However, if the company’s earnings are negative and other methods reveal surreal valuations, book value of equity can be used. If the company does not currently generate profit, the value of the company must be valued with other valuation methods. One way is to statistically estimate a ratio of EBIT-% to P/Sales (price-to-sales) of publicly traded companies. Assuming that the company will in the future reach the average EBIT-% of the industry, this estimated ratio can be used in valuing the company. This method can be applied only to companies that do not generate profit. This valuation method starts with estimating the return on equity (ROE) and price-to-book ratio (P/B). If the difference between current year’s and last year’s ROE-% is +/- 10 percentage points, a weighted average of these two is used in the calculations. Otherwise current year’s ROE-% is used. When ROE-% and P/BV have been determined the relationship between these two are estimated statistically from empirical data and based on this a value for the company can be estimated quite precisely. In multiple valuation the value of the company is estimated by comparing it to other companies in the same industry. In multiples valuation the value is estimated by choosing a central financial figure, e.g. net profit. This figure is then compared to the other companies to see at what relative price to the financial figure the companies have been traded. In practice, the companies that are used in the comparison are public companies, so the market prices are available in real time. The value of the company’s financial figure is multiplied by the average of the price/financial figure-ratios of the reference group and the private company discount is taken into account. This value is the estimated value of the company, provided that it is valued similarly as the reference group on the market. Example: Companies A and B are the only companies operating on their industry. Company A is a public company while B is not. During the past 12 months A has accumulated a net profit of €10 and its market value is €200.. A’s P/E (price-to-earnings) -ratio is therefore 200/10 = 20. During the same time period, B has accumulated a net profit of €5. Provided that A and B are similar companies, there is a reason to believe that the P/E-ratio is the same as for company A, i.e. 20. Thus, the estimated value of B is 20*€5 = €100. The multiples valuation methods gives at its best very accurate estimates for the company value. However, it does not take into account company specific prospects, but only the average valuation of the industry. Discounted cash flow (DCF) method is based on the time value of money. All future free cash flows are estimated and then discounted to present value. The DCF method is only as accurate as the estimates in the model. Therefore, it is advised to change or at least check the assumptions made in the valuation so that this method does not give an unreasonable estimate for the company’s value. The key assumptions in this method are: 1) the growth rate of revenues settles in the long term to the growth rate of GDP (3 %) 2) EBIT % remains at the same level as past four years’ weighted average. In DCF valuation the rate at which the cash flows are discounted is the weighted average cost of capital (WACC). It is extremely important to estimate the WACC as precisely as possible because it has a large impact on the cumulative discounted cash flow. The required return on debt is the average rate of the company’s debt and required rate on equity is estimated using the capital assets pricing model (CAPM). The situation of a company affects the amount of valuation methods available. The Valuatum system has three crucial financial figures which determine how the valuation is executed. Whether net income, EBITDA and DCF-valuation are positive or not, has an effect on the valuation path. The picture illustrates the possible paths and below you will find more detailed explanations of each path. This is the so-called normal case in which the company generates profit i.e. the net income is positive. In this case there is no restriction on which method to use, but it is sensible to use the methods that generate statistically most accurate results. The book value of equity is not a relevant method for valuing a company that has a positive net income. The book value of equity illustrates approximately the value of company’s asset if they were sold separately, it does not take into account the value created by the company. This method is applied when an unprofitable company sells its assets, thus it is not a suitable one for the normal case. Another method which is not used in the case of positive net income is the EBIT-% vs. P/Sales -method. The method assumes that the company’s EBIT-% settles to the industry average. In the case of negative net income this assumption is reasonable, but if the company generates profits and its EBIT-% is higher than the industry average, this valuation method may give too pessimistic results. Thus the EBIT-% vs. P/Sales -method should not be used in this case. By eliminating the above methods, we are left with four methods that give the most accurate valuation in the normal case: ROE vs. P/BV, Discounted Cash Flow and multiples (EV/EBITDA and P/E). The estimates from these methods are multiplied by suitable weights to get the final valuation. In the case of negative net income the principles of valuation are essentially the same as in the case of positive net income. However, the unprofitability creates some constraints on valuation. It is not reasonable that the value of the company is negative, which is why some methods are not used in this case. In addition, the weights of the methods are different to improve the accuracy of the estimate. Because of negative net income, P/E-multiple should not be used since it would lead to a negative valuation. However, EV/EBITDA ratio can be used since the operating profit is positive. Even though the company is unprofitable it might generate positive cash flows. In this case the discounted cash flow method can be used in the valuation. However, if the sum of the discounted cash flows is negative, this method should not be used. When a company is unprofitable its ROE-% is negative. ROE vs. P/BV -method can, nevertheless, be applied in this case, since the data used in this method also includes unprofitable companies. Therefore, this method is expected to be fairly accurate also in this case. Even if the company is unprofitable, it might be able to generate positive cash flow. 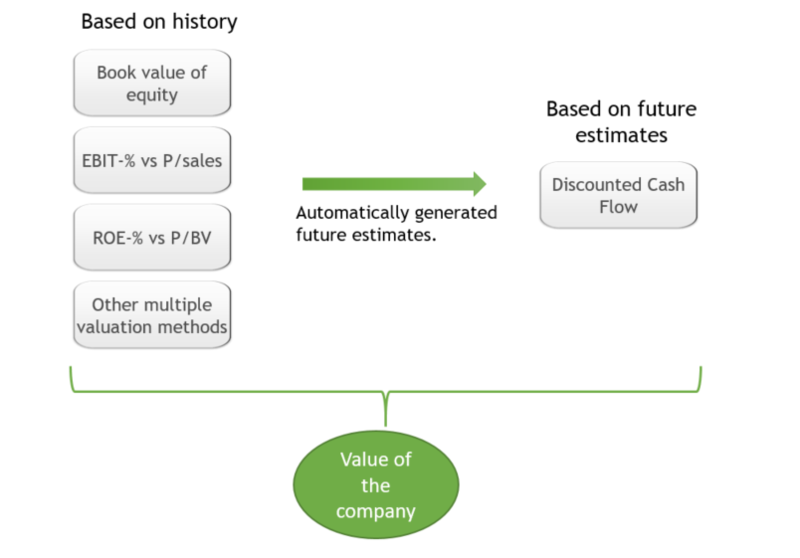 In this case the DCF method is used in valuation, but only if the cumulative discounted cash flow is positive. In the case of negative net income and positive EBITDA the method EBIT-% vs. P/Sales is also used. Because negative operating profit often implicates a weak EBIT-% it is in most situations reasonable to assume that the EBIT-% is below industry average. By assuming that the company will reach the industry average we can estimate the value of the company. This assumption is reasonable since if the EBIT-% does not increase the company will, sooner or later, go into bankruptcy. If company has a negative net income and DCF reveals negative value but it has a positive EBITDA, EV/EBITDA can be used. 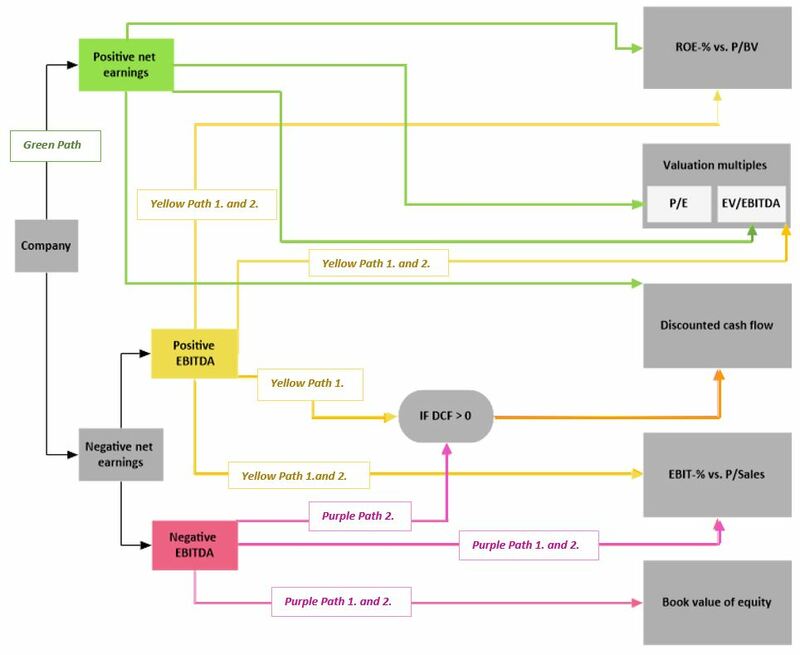 Due to reasons described above, also ROE-% vs. P/BV and EBIT-% vs. P/Sales are used in this method. However, the fact that DCF is negative differs this path from the second alternative. It is not reasonable to include a negative DCF into valuation process. The fact that DCF is negative may be due to several reasons which are not always clear when looking at the historical figures. Thus, in an analysis negative DCF should be left out and only the methods which do reveal a positive value should be used. When the company’s net income and EBITDA are both negative, the methods available for valuation are limited. Methods which use operating profit as parameter do not give sensible valuations and are therefore not used. Also, the discounted cash flow methods should neither be used, because the company is unable to produce positive cash flows and, thus, this method gives negative valuation for the company. In addition, methods which rely on net income are ruled out. In the case of negative net income and negative EBITDA, the valuation methods available are highly limited. These kind of companies are less often interesting targets for acquirers – more often than not, it is unreasonable to pay for a business that is unable to create profit with its operations. However, e.g. young growth companies may generate losses but nevertheless have potential to become successful in the future. In addition, some companies may be valuable due to the assets they possess. Because most of the methods are ruled out, we are left with only two methods. These are book value of equity and EBIT-% vs. P/Sales. The book value of equity is applicable since it does not depend on the income of the company. Especially in situations where the interest towards the company is based on its assets, the book value of equity gives reasonably accurate estimates for what the company may be worth. For this method to be accurate, it requires the assets to be valued correctly in the balance sheet. The book value of equity does not take into account future prospects of the company. Thus, this method does not give reliable results when used for valuing e.g. growth companies. Another way to evade the challenges of negative net income is to use the EBIT-% vs. P/Sales method. This method assumes that the company can reach the average EBIT-% of its industry. In automatic valuation company specific factors can not be taken into account in other ways than in the information provided in the balance sheet. Outlooks of two companies with the same financial figures may, however, be totally different. Therefore, the estimates provided by this method should be taken with caution. Overall, valuation of unprofitable companies are considerably harder than that of profitable companies and it relies strongly on company specific expectations. This is why the value estimated for unprofitable companies may not be close to the real value of these companies. Whereas profitable companies often resembles each other, unprofitable companies have often large differences. The accuracy of the valuation illustrates this; the estimates calculated for profitable companies are, on average, closer to the market value than the valuation for unprofitable companies. In case both net income and EBITDA are both negative but DCF reveals a positive value, the valuation path is slightly different than in the case of also negative DCF. Both book value of equity and EBIT-% vs. P/Sales are applicable in this case as they are in case of all three measures are negative. In addition, if DCF is positive we do not rule it out.